At Great Legal Marketing, we teach direct response marketing. This requires that you monitor your marketing very closely. For some types of marketing, we recommend that you create the materials yourself instead of outsourcing the work. The marketing that works requires work. 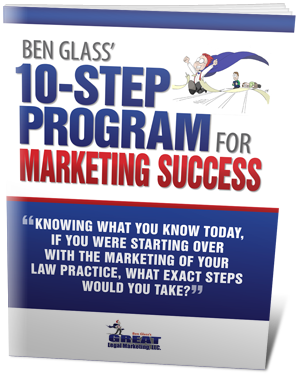 The most successful attorneys realize their job is 1 part legal, 1 part marketer, and 1 part entrepreneur. Please read the information below to find answers to the most commonly asked questions from attorneys doing their own marketing. Why should I focus my advertising on my free legal guide? Won’t people just request the book and then not hire me? Sure, that’s always a possibility. But it is highly unlikely that the information contained in your legal guide will allow the customer to proceed on his own (after all, if your free e-book can take the place of years of law school, nobody would ever hire a lawyer again). Imagine that your ideal customer is searching the Internet, trying to find a reliable source of information that can answer her legal questions. At this point, she’s probably not ready to hire an attorney; she’s “researching” her legal problem or shopping around to narrow down the choices for legal representation in the area. And what does she find? A ton of attorney websites trying to make a complete sale to the customer. They offer little information, except for where the attorney got his degree and his office location. They’re full of smarmy law firm taglines. They promise the reader that the attorney will win her case, even though they have never met and the lawyer doesn’t know anything at all about this potential client’s case. But now, she finds your site. It’s full of information that speaks directly to her problems and her current situation, and you’re offering her even more information at no cost. You don’t talk about winning her case or calling NOW for an appointment; you’re only trying to give away something for free. After all those other bogus sites, what a refreshing sight your offer will be! In instances where a customer who asked for your guide doesn’t hire you, you can still market to her (and by proxy, everyone she knows who is looking for an attorney) years into the future. If you had gone with the standard “free consultation” marketing, you still wouldn’t have gotten her business—but you also wouldn’t have added her to your marketing list. I don’t have time to write a newsletter every month. Can someone else do it for me? Who will do it? There are a lot of companies that offer “stock” newsletters that can be tailored to your business. Avoid them. Putting your name on a canned newsletter will waste money, hurt your firm’s credibility, and most likely never be read. Take the time to hire someone who will write meaningful and informative content. How should it sound? The last thing you want is your newsletter to sound like a legal brief. You must include current and useful information, but you have to do it in a way that engages your customer. An easy rule of thumb is, if you’re talking about yourself and not the client, rewrite it. Will it be worth it? If you already have a website with fresh daily content, you may not need to outsource your newsletter as well. You can always pull articles and blog posts (not to mention recent news items) to use as a monthly “round-up” of the goings-on at your firm. Remember: the whole point of writing a legal newsletter for marketing is to get your customer to initiate contact with you. If your newsletter is sent electronically, always include links to relevant items on your website, making it easy for your customers to find exactly what they’re looking for on your site with just one click. I can’t imagine turning down cases. Will it really help my legal business? It depends on the kind of business you want. If you don’t mind taking all the little cases—if you are truly happy working as much as you do for the money you earn—then there’s nothing wrong with that. However, most attorneys who come into the Great Legal Marketing fold are here for a reason: they want to improve their practice rather than just get by. When attorneys first start out on their own, they are told time and time again that they should sacrifice everything to maintain their practice. Their health, free time, family life and even sleep are considered non-essential when it comes to serving the public. After a few years of this, attorneys are reluctant to change the way they work—understandably, because it got them this far. But while building a great practice requires dedication, it shouldn’t require 100 percent of your life. That’s not practical, and it’s not fair. You got into this business for a reason, and YOU should dictate how your business is run. Which clients do you enjoy representing? What type of case gets you out of bed in the morning? Which of the above cases are the most profitable (both financially and personally)? Now that you know the answers, your best law firm marketing strategy is to attract these kinds of cases—and reject all others. Focus only on your ideal client’s case, questions, and problems, making him feel as if your marketing was created just for him. Every time there's a deadly traffic accident in my town, the local news media always picks the same personal-injury lawyer for a quote or a live interview. How can I get myself on the “go-to” list? Well, this is not something you an accomplish overnight. If your competitor is constantly appearing on TV and being quoted in news articles, it will be very difficult to dislodge him from his “celebrity” status, which was probably extremely hard-won. It's very likely that this lawyer labored in obscurity for years, slowly building his web presence, writing numerous blogs and articles, and sending out press releases whenever he had a successful outcome to a case (or even just to offer his perspective on breaking news stories). This lawyer also probably spent a fair amount of time cultivating the media, by shaking hands at local fundraisers or otherwise being active in the community. There are two ways to go about building your celebrity status. First, you need to emulate your competitor by building a solid 'brand” presence on the web, which will involve commenting frequently on breaking news stories in blogs and articles, and sending out press releases to trumpet your firm's accomplishments. Second, you may want to take a cue from this other lawyer by starting to cultivate the local media yourself—your local TV news producer or newspaper editor may not even be aware that you exist, and that you can offer another perspective on local news developments. You don't want to come on too strong—”How come you always call the other guy and not me?”—but a more gentle, friendly approach can work wonders. I have given my employees a script to use on the phone when talking to potential customers. It is working, or do the customers know it’s a sales pitch? Even though your customers are calling you to perform a service, they are still aware that they’re calling a business. That’s not a problem; they want to hire you, and you want to be hired. However, your initial contact with them can he handled in such a way that the customer feels better about his situation and reassured in choosing you to represent him. The best marketing for lawyers always includes a little trial and error. The surest way to know if something is (or isn’t) working is to test it, and this applies to your law firm’s phone etiquette as well. You can set up “mystery” callers to ensure that your staff have a firm grasp on your message before you release it into the public. Develop a few specific, pre-scripted scenarios. Callers are real people with real concerns, so invent a few typical clients. Make sure they each have a specific question to see how your staff handles it. Inform your staff that you will be doing mystery call training. Evaluate the staff member’s performance, including the time it takes to greet the caller, how they answer questions and attitude problems, and how they end the call. Adjust your team training based on your results. Involve your staff in the process, asking them what they thought could have gone better before giving them your feedback. You’re not going to be able to oversee every phone call that comes into your office, so it is important to have staff members who are well-trained in your company message, but can also think on their feet. I know my legal ad campaign is flawed, but I don’t know what the problem is. What can I do? If you’re like most attorneys, you’ll know if your legal ads are working only because you’ve seen an increase in business since your ad campaign started. However, this isn’t a good metric for success, since there are many different facets to your marketing. Confirm what is working. Always start with the positives. This will give you something to measure the other elements of your marketing against. Discover what isn’t working. This doesn’t mean “cutting” aspects of your campaign that aren’t doing well. In some cases, it could mean changing the way you do them. For instance, if you don’t have many Facebook followers, don’t delete the account; post a poll to encourage interaction, and set goals for updating every day. Find out what’s next. There should always be something “in the works” for your campaign. It could be a TV spot, a YouTube video with a celebrity guest star, or a tech-savvy tip that you try to improve your exposure. Implement one at a time; at the next meeting, it should be evaluated and placed on one of the other two lists. The most important thing is to do something every day that influences your advertising campaign. Collect emails, online articles, and news items in a folder to discuss at your next meeting. You never know what will be the next big thing in marketing, so it pays (literally) to keep your ear to the ground. I recently installed a phone surveillance system to monitor how my staff is handling incoming calls. I've noticed that one of my favorite paralegals has a very casual manner on the phone, which I fear may be repelling potential clients, but I'm afraid how she'll react if I criticize her. What should I do? Look at it this way—would you rather spare your employee's feelings, or send potential clients to that law firm down the block? Proper telephone demeanor is a key component in promoting your law firm. If your paralegal winds up losing her job because your firm goes out of business, that won't do much for her feelings, either, and you may be joining her on the unemployment line. Part of the baggage that goes with being the managing partner of a law firm is having to nip inappropriate behavior in the bud, which usually entails having some mildly uncomfortable conversations. Yes, you need to inform your paralegal that she has to present a more professional image on the phone, and you have no choice but to sit down with her, describe what you've seen on the surveillance tapes, and suggest ways she can improve the client experience. You may be tempted to skip the face-to-face meeting and simply send your staffer an email, but this is a very bad idea! If you present your critique the right way—not as a head-on assault, but as a series of gentle suggestions—your paralegal will be more likely to absorb what you have to say and change her behavior going forward. For all you know, she already senses that she isn't handling phone calls as well as she could be, and will welcome this opportunity to improve her performance—and if she doesn't, you'll know that you don't have a “team player” and that this person needs to be reassigned to a place far, far away from the phone banks. I prefer to sign up clients the old-fashioned way, by treating them to a nice lunch or dinner. Now I'm finding that this doesn't work as well as it used to. What can I do? It's true that, back in the '70s and '80s, successful lawyers had much more time to devote to the art of schmoozing, taking current and prospective clients out for fancy meals and cultivating their business. Except for some white-collar law firms, that way of life has disappeared in our modern economy. Lawyers don't have time to court new clients in person, and potential clients aren't interested in spending a lot of time with their lawyer before signing. They are researching several, sometimes dozens, of lawyers at a time. Typically, they make their choice before they come into your office. If you prefer the old approach to signing clients, you may find clients are resistant. Most of them don't expect to be "wined and dined," when they interview lawyers. Few other industries use this method of retaining new clients, and you may be setting yourself up for an awkward interaction. The prospect of a free meal may not be enough to get a potential client to spare two or three hours out of his day, especially if he's about to face some steep legal bills. Also, in today's Internet-saturated world, an increasing number of people prefer to keep their face-to-face interactions to a bare minimum, and would much rather conduct business via email or instant message. Plus, if you give your potential clients so much attention before signing them, they will expect that level of attention after you sign them. Imagine taking your client to dinner each time you have to update them about your case! Ideally, with good marketing your list of potential clients will rise to levels where this kind of networking is unsustainable. So what can you do? There's nothing wrong with splurging occasionally and treating a willing client to lunch. But, given the circumstances obtaining in the modern economy, you should also invest in an automated client-retention system that can follow up on prospective leads and spare you the time, money and effort needed to schedule a meal.